Mitch became caught up with his career as a sport commentator and journalist. He ignored his girlfriend and did not make time to do things in life that are of the most value to a human being. Morrie was one of Mitch's professors in college and a famous scholar. One day Mitch was watching television and saw Morrie giving an interview stating that he is dying of Lou Gehrig disease or ALS. The true story of Richard Pimentel, a brilliant public speaker with a troubled past, who returns from Vietnam severely hearing -impaired and finds a new purpose in his landmark efforts on the behalf of Americans with disabilities. “Music Within” is less than subtle about the way people were treated before and after the Disabilities Act, and depending on one’s tolerance for overstatement, the film might tread a bit heavily on the moral outrage. But Sheen (best known for playing Tony Blair in “The Queen” and David Frost in “Frost/Nixon”) is remarkable -- one of the film’s stratagems is that Art [a man living with cerebral palsy] is made understandable through Richard’s eyes and damaged ears, but a garble otherwise. So Sheen is really required to give two technically difficult performances. He’s utterly convincing, and the humanity he brings to the part only helps drive home the film’s social issues." Michelle Pfeiffer and Sean Penn give career-defining performances in this humorous and heart-warming film about a mentally-challenged father who enlists the aid of a high-powered attorney to help him regain custody of his daughter. An all-star supporting cast and a spectacular soundtrack complete this unforgettable story of life, love and laughter. Tale of a father who struggles to bond with his estranged son Gabriel, after Gabriel suffers from a brain tumor that prevents him from forming new memories. With Gabriel unable to shed the beliefs and interests that caused their physical and emotional distance, Henry must learn to embrace his son’s choices and try to connect with him through music. A young music student has a seizure forcing her to undergo brain surgery. She comes out of the surgery unable to count or read and has difficulty adapting to life. The documentary Gantenbein is about a guy called Gijs, who has a had a brain operation which went terribly wrong… so wrong that he had to learn his own life through photographs. His wife showed him pictures: ‘it is me over there, so that must have been parts of my life.’ Gijs cannot read a book anymore and moves through life like Gantenbein. ( he was a German teacher once and loved the book Gantenbein of Max Frisch, in this book a guy pretends tt be blind- but he isn’t really). Gijs has two kids and a wife – he didn’t recognize them after the operation. The weird thing was: he was operated on his left side of his brain and after the operation he was paralized on the left side of his body – then his wife realised that something MUST have went terribly wrong during this relatively simply brain-operation. She is sueing the Dutch hospital for around ten years now.. but nobody will admit something went wrong. All the neurologists (only a few in Holland) support each other. It is a well made and interesting documentary that was on dutch television. Feisty elderly lady laments the effects of her declining memory. Rome and Julie end up in the same psychiatric ward a month after their relationship’s sudden end, though Rome’s case of amnesia means that she doesn’t remember the relationship at all. Clayton lost his wallet, and he hasn’t paid the water bill. Which wouldn’t be so bad, except he also lost his job sweeping up at the theater. Small, East Texas towns like Reklaw don’t have too many jobs for guys with a brain injury, slight paralysis and an occasional lack of good judgment. FORWARD/BACKWARD tells the story of Clayton Miles, brain injury survivor and East Texas charmer. Due to a “vehicular collision at the age of 16,” Clayton doesn’t walk, talk or think like most people. The untimely death of his uncle means Clayton must come home early from brain injury camp and return to his father, Willie, a truck driver who has essentially given up on his own life. When Clayton’s best friend, Josh, gets back from the Marines, Clayton couldn’t be happier. He’s sure the good old days of drinking, chasing girls and philosophizing have returned. But Josh isn’t the same guy who left four years ago. He’s no longer satisfied with just living in Reklaw, working for minimum wage and spending his money on beer and cigarettes. Josh dreams of Hawaii, of Willie Nelson concerts, of a life beyond this small East Texas town. And ultimately, despite the responsibility he feels for Clayton, his ticket out of Reklaw becomes painfully clear. For Clayton, it seems that an endless series of accidents, funerals, jobs, screw-ups, well-meaning family members, friends and girlfriends are what make up his life. But also humor and poetry and passion. And if that’s not enough, Clayton can always have just one more chance, can’t he? FORWARD/BACKWARD is Clayton’s story, but it is just as much a story about how the people who encounter Clayton understand him – or don’t. As his friends and family grow and change, Clayton remains relatively unchanged. How much of Clayton is his brain injury, and how much is him? Can you even separate the two? Set against the backdrop of a small-town America soon to be rocked by the events of September 11th, the boundary between you and the underworld is only a matter of pumping a little oil, taking a drive down those winding, East Texas roads or signing away your life just for a chance to get out. Northern Lights is a story of love between two brothers who in different ways stands unsure in the world. A story about their relationship that for reasons neither remembers any longer has turned smiles into silence. The two brothers are going on a voyage together in search of the intimacy that they no longer possess; but it’s not going to be an easy journey. Samuel, the older brother, has a serious brain damage, while the younger brother Simon’s doubts are harder to diagnose. Simon and Samuel set off to find the Northern Lights. But how do you find the Northern Light, and how do you find the light within yourself? The story of a man who suffered a head injury in a skiing accident that left him with no sexual inhibitions. The programme explores how the human brain is, under normal circumstances, able to repress and control animal instinct, as well as examining the case of a former teacher on trial for abusing his stepdaughter. Neurologists claim his crime was the result of a brain tumour crushing his frontal lobe. A video first-person road movie about disability, civil rights, and the search for intelligent life after brain damage. A nurse, trying to salvage her life after her husband and job are gone, winds up working in a halfway house full of mildly brain-damaged patients and receives help from those she helps. Henry Turner is a despicable and ruthless trial lawyer whose life is turned upside down when he is shot in the head during a robbery. He survives the injury with significant brain damage and must re-learn how to speak, walk, and function normally. He has also lost most of the memory of his personal life, and must adjust to life with the family that he does not remember. To the surprise of his wife and daughter, Henry becomes a loving and affectionate man. This film provides a very personal look at the lives of three soldiers from Michigan’s Upper Peninsula before during and after their deployment to Afghanistan. That one of the soldiers, Dom, is a talented young artist is particularly fascinating and provocative. This film shows the human side of war that often gets lost among the flags and parades. This is a picture about the young men who go to war not the politics that sent them halfway around the war. It is a coming-of-age story about what war does to a man’s body and soul. They return for war forever changed by what they have experienced. The filmmaker, Heather Courtney, does a wonderful job of allowing the soldiers to tell their stories, present their view of the war they are fighting and tell the audience about their little corner of America that most of us have never visited. Since they are assigned to explosive ordinance disposal team which is searching out Improvised Explosive Devices (IEDs), this is in many ways a true to life version of the Hurt Locker. The film is compelling and powerful. When Adam is 8, he gets hit by a car, suffers brain trauma, one arm and leg will always be weaker than the other and he has a pronounced limp. During this time his parents get divorced and he grows up with his mother, Karen. Now Adam is 17, a senior and attending a new school. Jackie, a pretty girl, is nice to him and some of the popular kids, Ethan, follow her lead and treat Adam pretty well. Their old friend James, however, stirs up trouble. James continually picks on Adam, and the two keep getting into trouble at school for fighting. One day a speech competition is announced. Adam wins it, does his speech but gets into another fight with James and the two get expelled. Adam plummets in depression but writes a book and gets it published. Years later his book is this story. Matt King’s family has lived in Hawaii for generations. His extended family – namely he and his many cousins – own 25,000 acres of undeveloped land on Kauai held in trust, which ends in seven years. The easiest thing for the family to do is sell the land before the seven years is up, which is all the talk in the state, as, to whom they sell the property could very well change the face of Kauai. Despite the vast wealth that comes with the land, Matt has decided to live solely on what he earns as a Honolulu lawyer. However, Matt has not had a perfect life living in Hawaiian paradise as many believe. He and his wife Elizabeth were having problems in their marriage. She recently got into a boating accident which has placed her in a coma. Their seventeen year old daughter Alex is in boarding school on the big island since they couldn’t handle her rebellion, which was made all the worse by an argument of an unknown nature between mother and daughter during Alex’s last visit home. And their ten year old daughter Scottie is starting to act out, which Matt doesn’t know if he can handle, potentially raising her on his own. Matt decides to bring Alex home upon news that Elizabeth is brain dead, and that she will be pulled off life support. But revelations about Elizabeth and Alex’s argument, which is tied indirectly to the issue of the land sale, leads to some decisions on Matt’s part about what is best for him in both mourning Elizabeth’s death and what is the best thing to do about the land, the two decisions which may be incompatible. On Christmas Eve, Lefty is a homeless and unemployed alcoholic loser that will lose the right to see his son. In despair, he trades a gun and is ready to heist a convenience store and commit suicide. Eva is a lonely old lady estranged from her family that is ready to commit suicide. Kirk is the owner of a convenience store and gas station that feels stranded in his work. Mary is a mother that is raising her young son alone after the accident of her husband that has brain damage. Mitch is a youngster that belongs to a Christian group of youths that does not understand the reason why they should visit lonely old people of his community in the Christmas Eve. The lonely and depressed persons have their lives affected for good by minor acts of kindness and sympathy and Mitch realizes how important his assignment has made the difference. There’s never been a documentary like HBO’s “The Crash Reel”. And that’s exactly the point, says director Lucy Walker. But not many filmmakers have tried to capture that breadth, or used pro sports as a backdrop. That’s one reason “The Crash Reel” stands apart, detailing snowboarder Kevin Pearce’s rise, fall, and recovery. Story line: A young San Francisco management consultant is struck by a car & sustains a serious concussion. Due to severe post concussion syndrome, he is terminated by his employer and dumped by his girlfriend. He is left to rediscover himself, his family, and the meaning of true friendship. Accuracy: Highly accurate account of TBI. The filmmaker wrote, shot, and edited the film after he was struck by a car and suffered a severe post-concussive syndrome. The film does an excellent job of taking the viewer into a day-in-the-life account of coping with TBI. The viewer is shown neuropsychological exams, battles with insurance companies to receive disability, and botched attempts at healing via complimentary medicine. The film also illustrates many symptoms TBI survivors suffer, such as headaches, confusion, nightmares, memory lapses, inattention, troubled speech, inappropriate behavior, mood swings, and difficulty with visual processing. Post Concussion is an affirming film that acknowledges and gives justice to the experience and aftermath of head injury. For more on the film and the filmmakers' back-story go to bluewaterfilms.com. More recently I watched “Amour” a French film about an older couple whose life changes when Anne, the wife, has a series of strokes and her husband Georges cares for her through her continuing deterioration. This movie is hard to watch. It almost too vividly portrays the daily life of caring for someone you love, with little support, and watching their deterioration. You are compelled to consider the dilemmas that arise such as What is quality of life, for the person, and for the caregiver? How far do you go to uphold a person’s wishes when it impacts on others?Such as remaining at home or moving to supported care. ‘The Diving Bell and the Butterfly’ is a movie I have described many times during training sessions. There are many lessons to be gained in this biographical account of Jean-Dominique Bauby who had a stroke, affecting his brain stem, leaving him with what is known as “locked in syndrome”. He is able to blink both eyes initially, then only one, otherwise he is completely paralyzed. As I recall this movie I think I will one day feature it as a post of its own and talkmore about its impact.In brief it was a wonderful reminder of what can be achieved when supporters look at what a person CAN DO. Given all his difficulties and problems his therapists looked beyond them to what he could do – blink one eye. They devised a way of communicating and discovered his desire to use his imagination, and to write a book. So, while movies are not real life, and may not even be realistic, they can highlight some key points to remember. They can entertain us and teach us at the same time. You will notice over time that I like to learn about brain injury in ways that are engaging, and as simple as possible! This documentary was co-created by Jerome Kaplan (speech-language pathologist) and Vincent Straggas. It shows the communication/daily living struggles for people with aphasia and the people in each persons' community but also the joy and improvement in their lives since aphasia. This film is about actor Carl Mcintyre and his recovery after his stroke. He was diagnosed with aphasia following his stroke which impacted his ability to communicate. However, Carl is now a motivational speaker and maintains a positive attitude about aphasia. This film is usually played following a presentation/Q&A session about aphasia. This short film is a guide for people with aphasia as well as others in their lives to help them learn how to communicate more effectively with aphasia. It gives facts about aphasia, discusses how it feels to have aphasia, and gives strategies to help people with aphasia communicate. This film is available in both English and Spanish. There are many illustrations and animations in the film as well. This film is about multiple people who have aphasia and their stories. While they are telling their stories, the stories are shown as drawings which "were designed to help bridge the gap between hearing, seeing, and comprehending. The images are to act as an aid in the understanding of spoken language" (Martha Taoylor Sarno - http://www.aphasia.tv/index.html). This film is about stroke survivor Dan Mountain. The film details Dan's life before the stroke and afterwards. Music from the film was written prior by Dan Mountain and Marc Black. 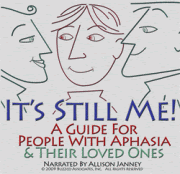 This film is often shown as part of a presentation/Q&A session about aphasia. Explores common anti-depressants and ADHD medications, the effects on children and other issues related to our medicated selves. Following the resolution of Operation Desert Storm in 1991, American troops returned home to a rousing welcome from a grateful public. But for many of these veterans, their war had just begun. Widespread incidents of memory loss, eyesight impairment and cancer were reported among the troops, and their offspring born after the conflict often presented with physical abnormalities and severely debilitating conditions like leukemia. Were these the effects of some highly advanced form of post-traumatic stress syndrome, or something else? This is an Oscar nominated 1983 documentary film exploring the issue of mentally ill children and the institutions they lived in. The film not only exposed the abuse in mental institutions but it also educated people that mental illness can happen to anyone. After the Civil War more than half of the patients in mental institutions were veterans. In 1980 post-traumatic stress disorder (PTSD) became an accepted diagnosis for veterans with psychological wounds. Based on personal accounts of American soldiers whose physical and mental health was torn asunder by the shock and fear of bloodshed and PTSD, the documentary narrates the chronic effects of battle agony and post-traumatic anxiety on military personnel and people close to them throughout American history... from the Civil War through today's modern warfare in Iraq and Afghanistan. Only someone who has had it knows how paralyzing depression can be. No one is immune. There's a one in four chance that depression will affect you at some stage in your life. It's bad enough to get it, but the stigma can make you feel much worse. This is the truth about depression. People battle with chronic depression for decades. It is extraordinary that thousands of us will suffer from depression and yet so many people will feel the need to hide it. Why? Because of the stigma. People with depression are judged to be weak. Some people even go so far as they think it does not exist. Stephen Nolan wanted to find out the real truth about depression. We are told that cholesterol is a major cause of heart disease. At least 40 million people are currently taking cholesterol-lowering medications, known as statins, and millions more people are avoiding foods that contain saturated fat and cholesterol. Alberto Villoldo, psychologist, anthropologist and bestselling author, has studied the shamanic healing practices of the Amazon for over 25 years. In this beautifully filmed documentary he reveals secrets of the jungle's sacred plants and the healers who administer them, deep in the Amazon rainforest. There are approximately 5.7 million people in the United States with bipolar disorder. In an attempt to eliminate the mystery and misinformation surrounding the illness, many throughout the country diagnosed with this condition were interviewed extensively. Back From the Edge offers guidance on treating Borderline Personality Disorder. Borderline Personality Disorder (BPD) is a relative newcomer in the field of diagnosable psychiatric illnesses. The individual with the disorder and his or her family usually find themselves in need of multiple support systems due to the complexities of the diagnosis. Henry Thomas Marsh, (born 1950) is a leading British neurosurgeon, and a pioneer of neurosurgical advances in Ukraine. Marsh originally read Politics, Philosophy and Economics at Oxford, achieving First Class Honours, before graduating with Honours in Medicine from London University. He is now the senior consultant neurosurgeon at the Atkinson Morley Wing at St George's Hospital, one of the country's largest specialist brain surgery units.